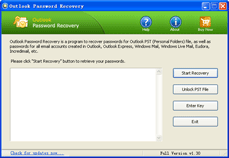 Outlook Password Recovery is widely used to recover lost or forgotten passwords to password-protected Personal Storage Files (*.pst file), as well as mail accounts created in Outlook 2007, 2003, XP, 2000, 97, Windows Mail, Windows Live Mail, Eudora and Incredimail. It can also recovers login and password for all mail and newsgroup accounts in Microsoft Outlook Express. * Recover passwords from the following email clients: MS Outlook, Outlook Express, Windows Mail,Windows Live Mail, Eudora, Incredimail.